I’ve long been aware of The Lightbox and, when I read Florence Water’s article in January’s Apollo, I decided that it was time for a Mini adventure to Woking. 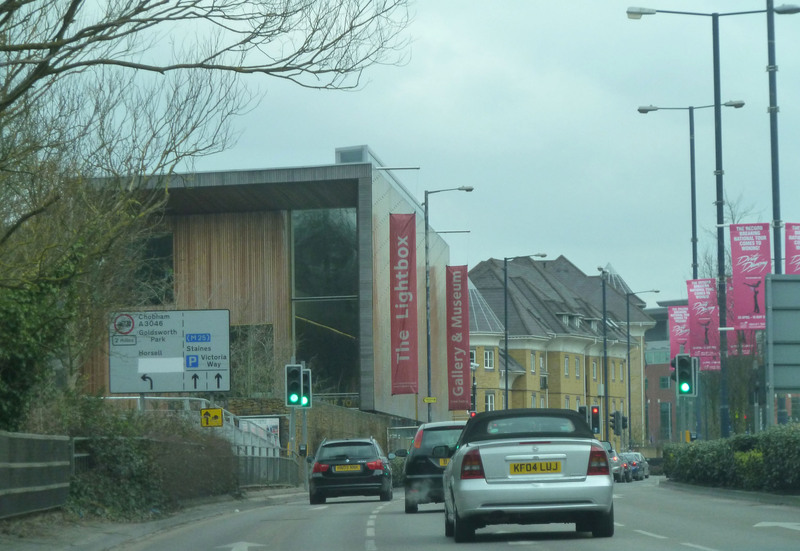 The Lightbox, Woking, Own photograph. 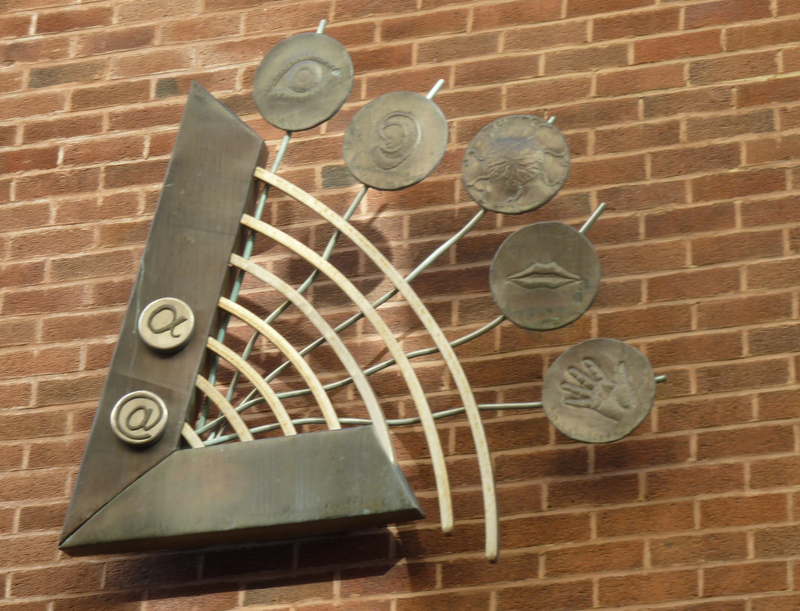 In 1993, a group of 70 arts and heritage enthusiasts decided it was time to create an arts centre in Woking. 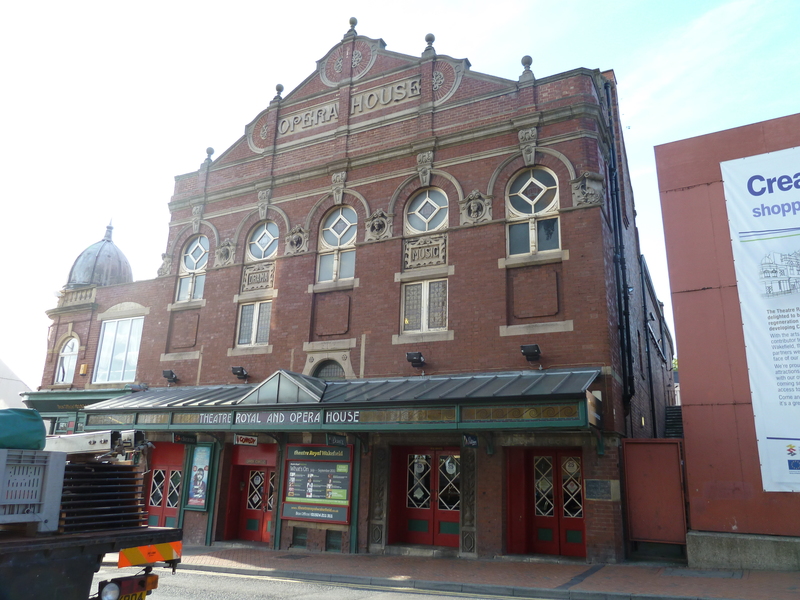 Through their endeavours they achieved this goal raising more than £7 million and in September 2007 The Lightbox opened its doors (be careful on your way in as the automatic doors open outwards). Although the gallery does have a permanent body of staff, it still relies largely on the support of its 150 volunteers showing the strength of community in these parts. Education is obviously where this gallery comes into its own – as well as having great learning facilities, they run a young curators’ group, after-school arts clubs and more structured schools’ programmes that work within the national curriculum. 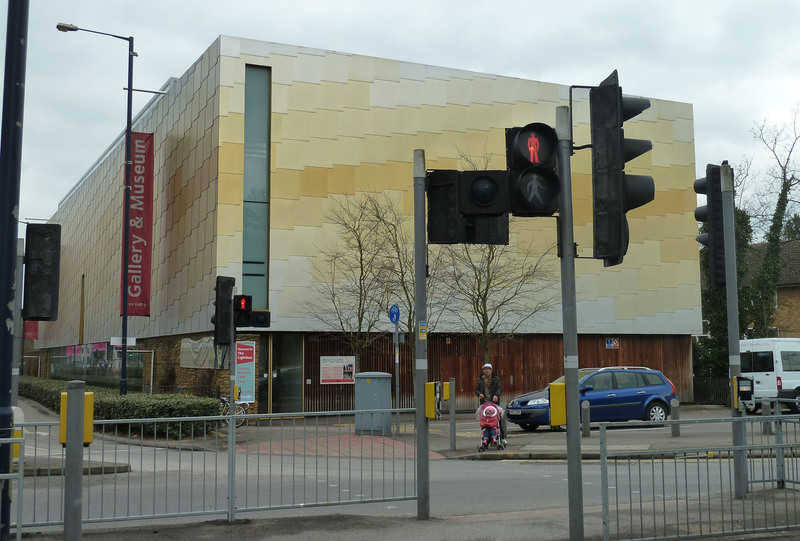 The Lightbox is located alongside numerous shopping centres, endless multi-storey car parks, lane after lane of traffic and more traffic lights than I’d care to count; its striking design sticks out like a sore thumb. This is obviously the most impressive building in town although I’m not sure there is much competition; designed by Marks Barfield Architects it is found, clad in wood with gold and silver aluminium panels, alongside the Basingstoke Canal. The canal-side garden is protected by a gabion wall, gesturing to Renaissance fortifications. Inside is the most wonderful expanse of wall, lit from an atrium that stretches the entire length of the south side. 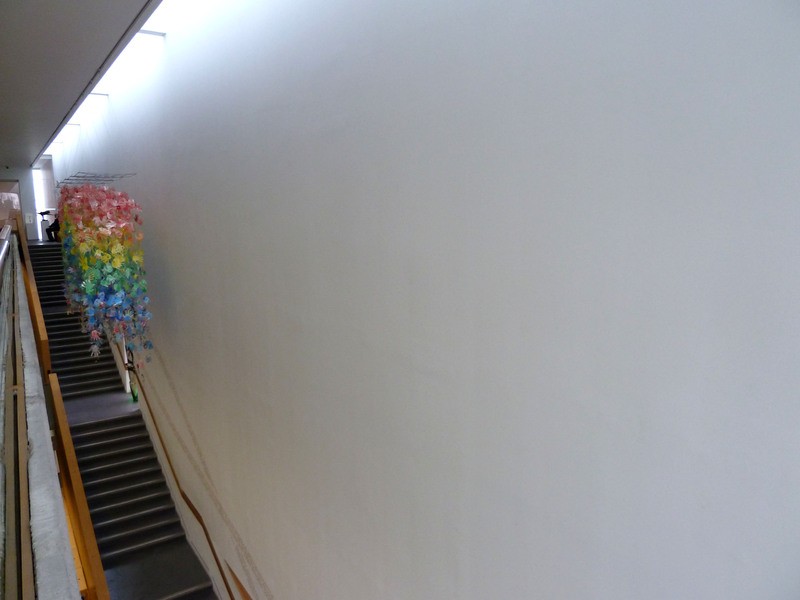 Currently there’s a mobile of hands hanging in the space but there is a painfully ‘blank canvas’ of white wall. Considering the surroundings this architecture is challenging but it is successful and effective. The white wall. Own photograph. 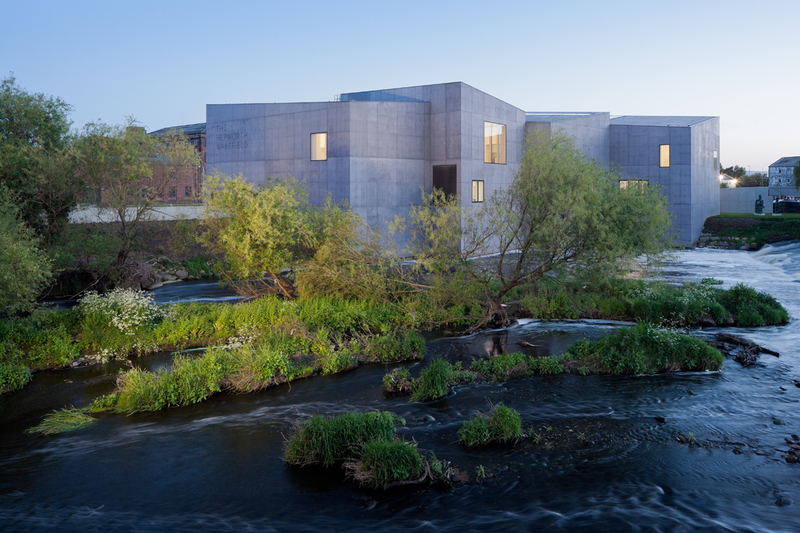 Most of the time, The Lightbox is filled with Chris Ingram’s spectacular collection of Modern British Art, helping to fulfil his desire to make this period more accessible to a wider public. The drawback of visiting during the Frink exhibition meant I saw very little of the collection I had hoped to view; it is usually on permanent rotating display in the Lobby galleries (aka the corridors). I made do with buying the books to give me a greater insight into the Ingram Collection which really is incredible, showing the works that Ingram likes and chooses to share with the nation. The generosity of his loan programme across the country and, indeed, his permanent loan here is fabulous. Chris Ingram at The Lightbox. Image via www.surreylife.co.uk. You’d be forgiven for not knowing that Woking is the home of Kenwood food mixers and also where HG Wells wrote War of the Worlds. 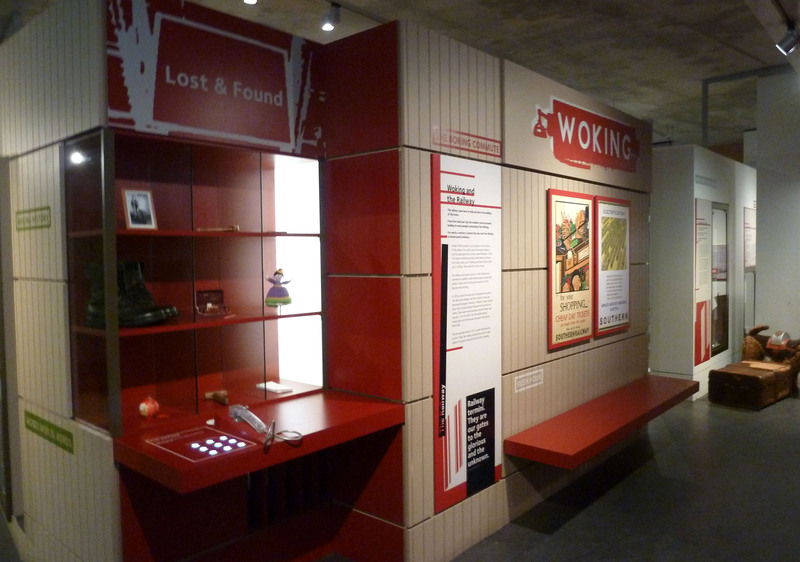 Part of the aim of the gallery is to house Woking’s Story which tells the social history of the town looking at the railway, the history of mental health through Brookwood Hospital, Brookwood Cemetery (once the largest cemetery in Europe) and Britain’s first purpose-built mosque. This display is aimed at a young audience and, although simplistic in format, it does well at highlighting the cultural importance of the area. 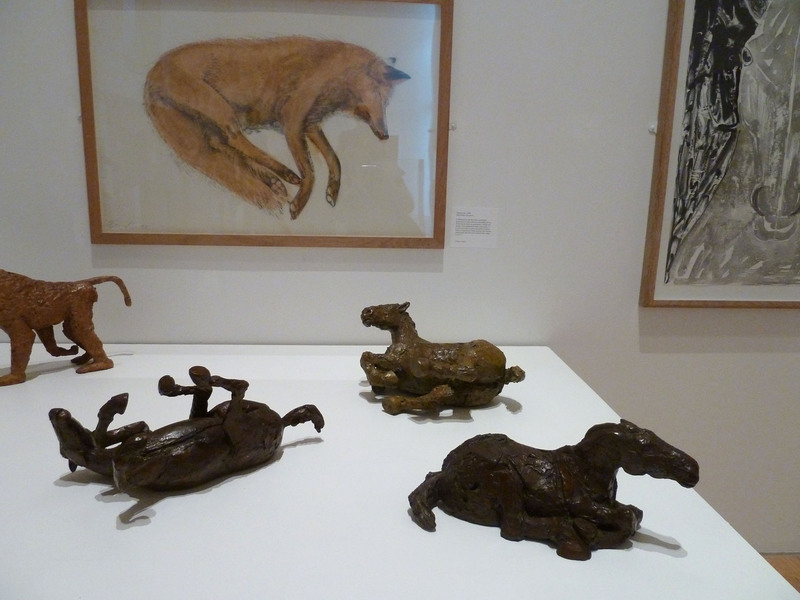 Currently, The Lightbox is mounting a retrospective of Dame Elisabeth Frink’s career. In the 1960s, while other artists turned increasingly to abstraction, Frink continued to pursue an interest in figurative and naturalistic imagery. 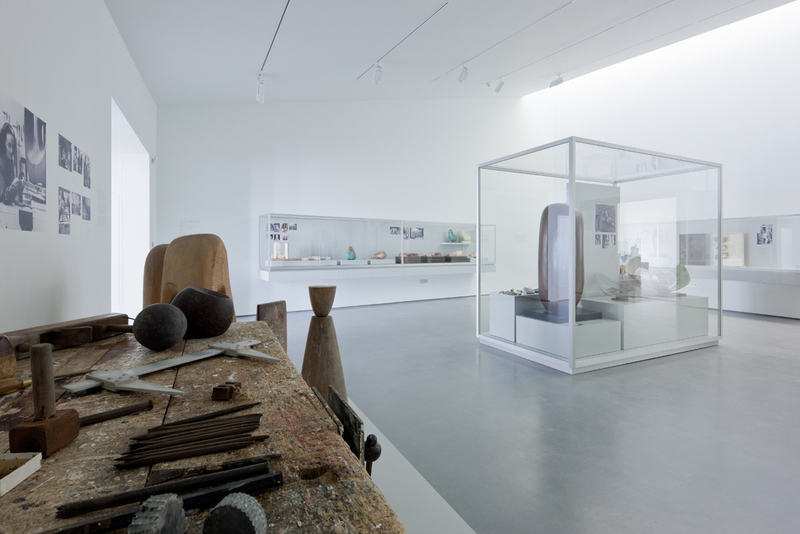 The sculpture gallery on the ground floor. Own photograph. 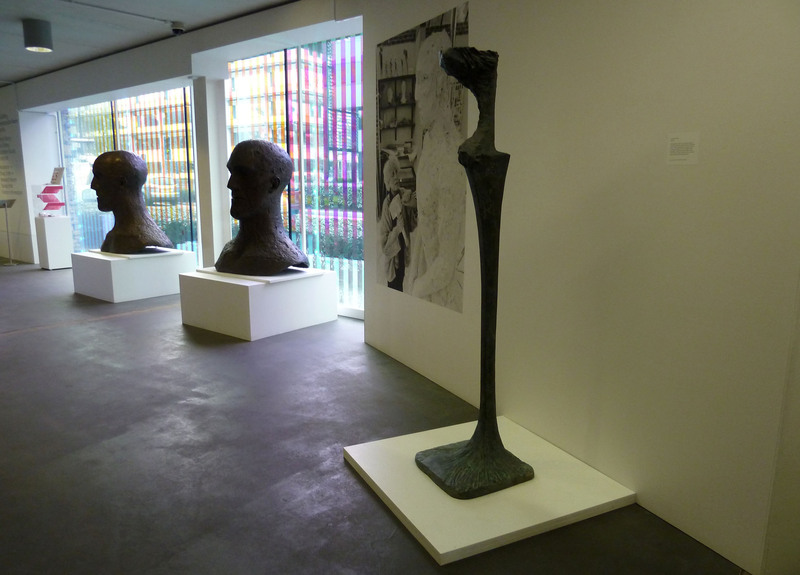 In the double-height gallery on the first floor we are introduced to Frink’s main artistic concerns: Frink had no interest in sculpting the female body saying it didn’t act as a suitable vehicle for her ideas. Her fascination with man (whether standing, walking, running or seated) extended across her career, expressing ideas of masculine courage, strength and heroism. Her men are complicated vessels of emotion, sensuality and vulnerability. The main gallery. Own photograph. Her interest in animals – horses, dogs and birds – also comes to the forefront here. She admired the strong bonds between man and beast – the loyalty, intimacy and interdependence. Throughout the exhibition, which is spread across the building, we also see her heads, religious iconography and her vast array of print work which strongly complemented her sculptural processes. 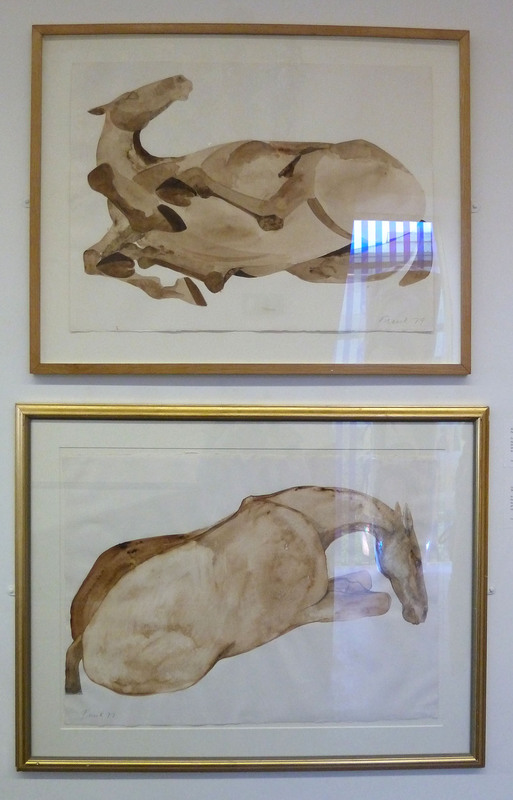 Frink’s Rolling Over Horse, 1979, and Lying Down Horse, 1977 from The Ingram Collection. Own photograph. 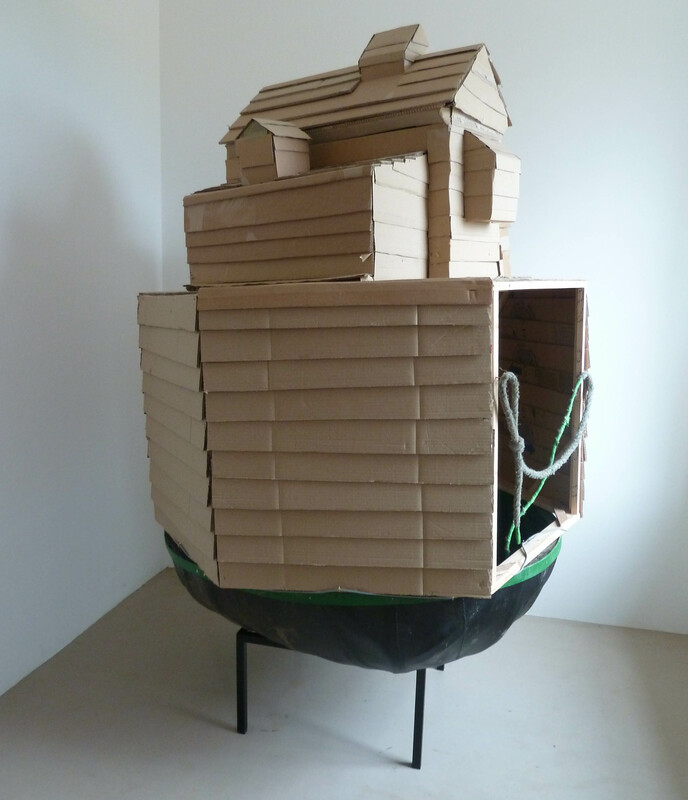 But, the gallery just hasn’t done very much with this amazing body of work – the pieces lose something by being plonked in the corridors and placed higgledy-piggledy across the space. We encounter the first Frink sculpture within seconds of walking through the front door before we’ve even seen a welcome panel. The labels are sheets of sticky paper that are peeling off the walls. The lids of the Perspex cases aren’t actually screwed down (possibly not the best protection then) and are so smeared in places that it’s difficult to see the works beneath them. 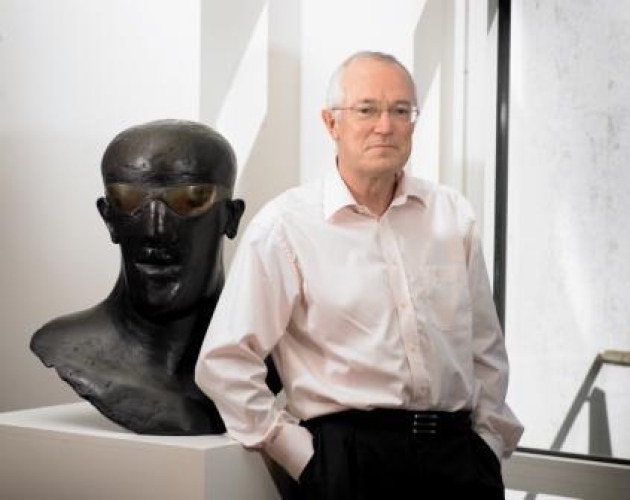 Ingram, the inventor of the modern media agency, has a fascinating background and obviously understands the importance of quality finish and appearance. Perhaps it would be worth him sharing a little of his expertise, as well as his art, with the gallery. Water wrote that ‘he loathes preciousness’ which I get and I have the utmost admiration for the aims of this space but The Lightbox comes off as distinctly amateur – it is not doing justice to the great works of art that it has the privilege to display. Victoria Way runs next to the gallery. Own photograph. 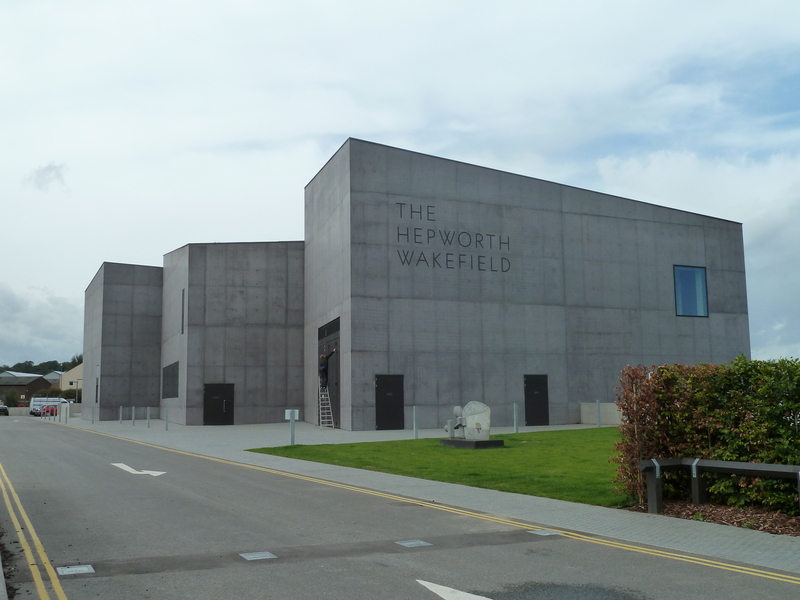 Hepworth Wakefield, Pallant House and Turner Contemporary can all get it right so being out of London is not an excuse. If The Lightbox wants people to come to see their gallery a little more work needs to go into the presentation and the curation needs more thought. The exterior is wonderful and I hope that, in time, the interior will match it. There was a huge party of men in fluorescents walking around so maybe they are planning some work to The Lightbox. All the enthusiasm and dedication that formed this gallery in the first place needs now to be used to take The Lightbox to the next level. 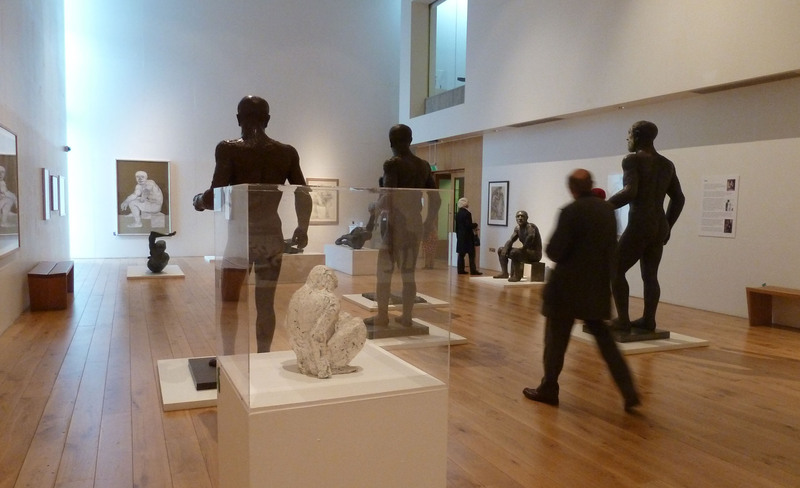 Elizabeth Frink: A Retrospective is at The Lightbox until 21st April 2013, www.thelightbox.org.uk. 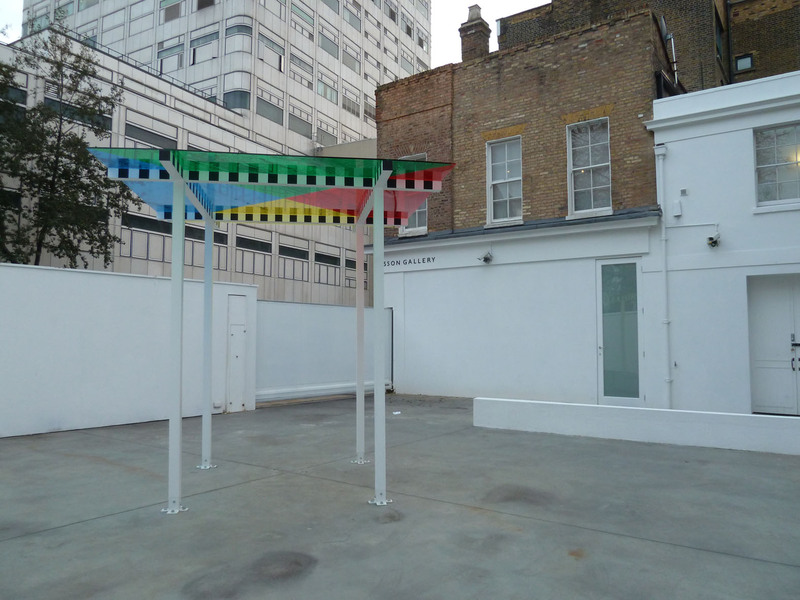 Because it’s not right in the heart of Mayfair Parasol Unit often gets missed off the PV lists but art enclaves now exist all over London and Islington isn’t really as out of the way as many people think. Last night, with dinner plans only a five minute drive away in Clerkenwell, I was determined and went to see Parasol’s new exhibition – Lines of Thought. 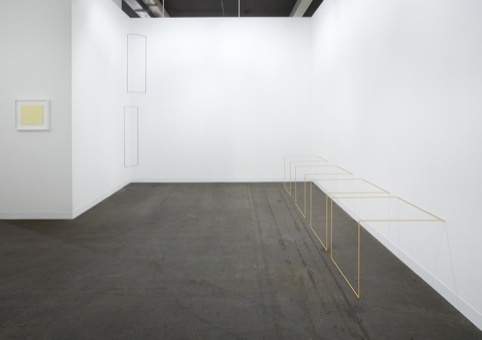 A mixed show, the exhibition includes work by Helene Appel, Hemali Bhuta, James Bishop, Raoul De Keyser, Adrian Esparza, Özlem Günyol & Mustafa Kunt, Sol LeWitt, Richard Long, Jorge Macchi, Nasreen Mohamedi, Fred Sandback, Conrad Shawcross, Anne Truitt, and Richard Tuttle. 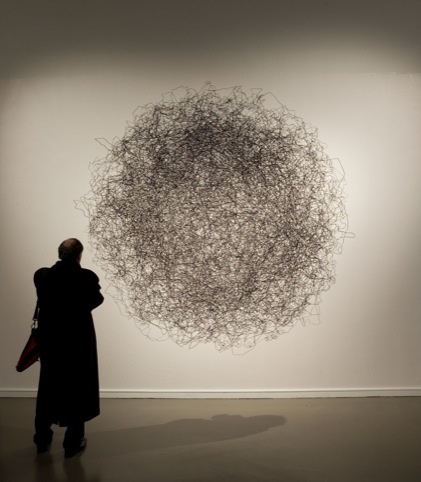 Özlem Günyol & Mustafa Kunt, Ceaseless Doodle, 2009. Image via www.designweek.co.uk. Line is one of most powerful forms of artistic expression in history. 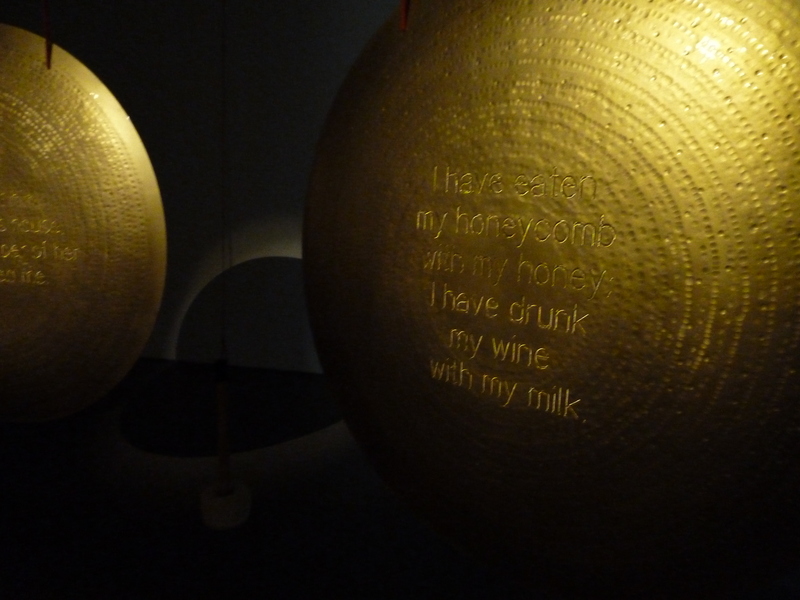 The exhibition, therefore, was based around a very simple premise. Whether seen as continuous, broken, curved or straight, it’s everywhere and forms the basis for everything. Some of the works show the magnitude and extravagance that can now be achieved through a focus on linear exploration. Fred Sandback, Untitled Nr 4, 1968/1983. Image via www.designweek.co.uk. Raoul De Keyser’s paintings, upstairs at Parasol, recall the workings of such Abstract Expressionists as Mark Rothko, where he has divided the small canvases into black and white fields, playing with the horizontal. His paintings are introverted, self-reflections on his varied life. 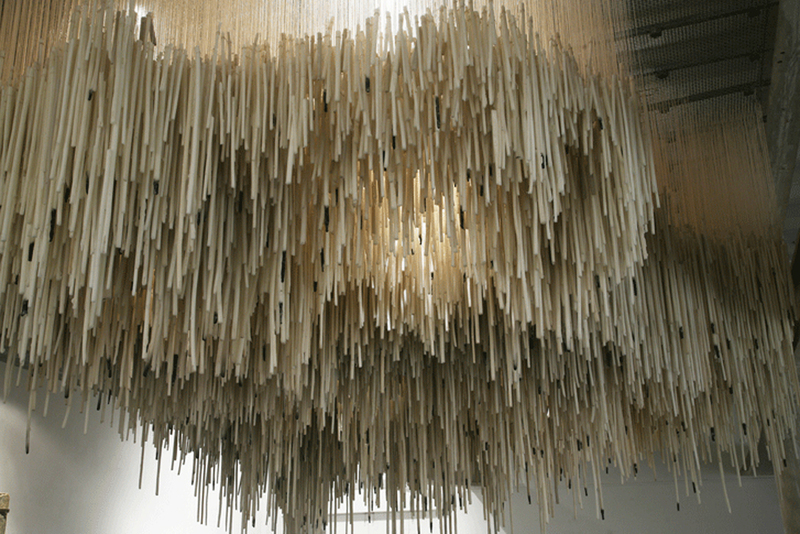 Downstairs is more dramatic; Hemali Bhuta’s Stepping down is a site-specific installation using thousands of wax stalactites to mimic candles. The impressive installation is somewhat diminished by the range of works in the gallery but the piece is still visually striking, transforming one corner of the room into a cave-like space where dripping formations evolve out of the ceiling. Hemali Bhuta, Stepping down, 2010. Image via www.parasol-unit.org. Adrian Esparza’s new work, So Fast and Slow, shows a mounted Mexican blanket that has been partially unravelled. Much of his inspiration comes from his borderland experience in El Paso, where he lives and works, and his daily encounters with political divides. Although So Fast and Slow is a new work this year, Esparza has created similar pieces before. 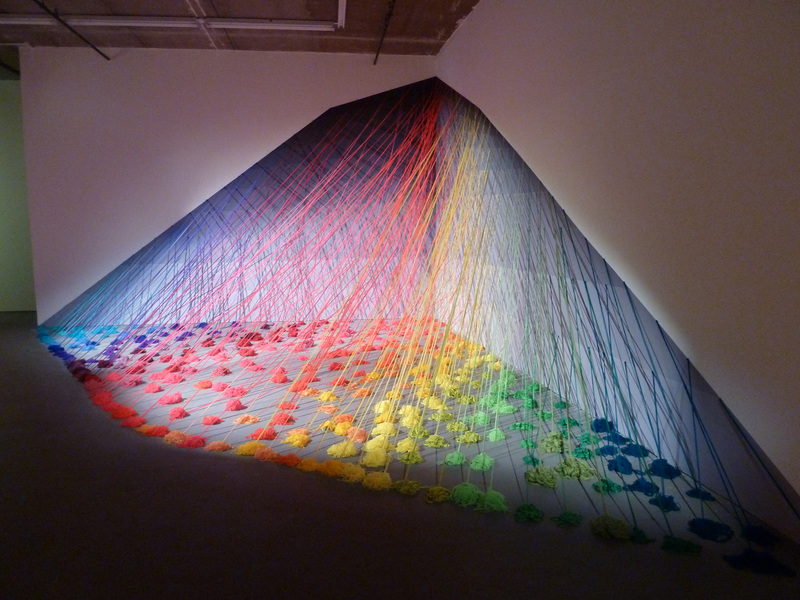 Here, guided through a loom-like maze of nails, the cotton thread becomes a strikingly geometric colourful landscape looking at the turbulent history it represents. Esparza shows the blanket both as a constructed object and as a deconstructed form suggesting the potential for new possibilities from past forms. Adrian Esparza, So Fast and Slow, 2012. Image via www.parasol-unit.org. Of course, no exhibition on line would be complete without Richard Long (fresh from Haunch of Venison) and Sol LeWitt’s Wall Drawing #103 from 1971. 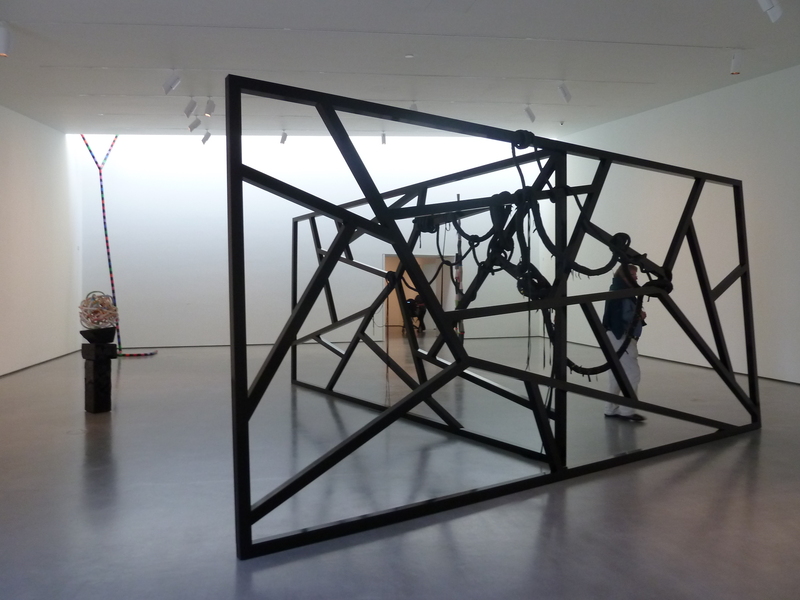 For me, Conrad Shawcross’s Harmonic Manifold 1 (5:4) stands out and still has the same mysterious enigma as when I first saw it at Turner Contemporary and then again at Frieze – it’s been around quite a lot. 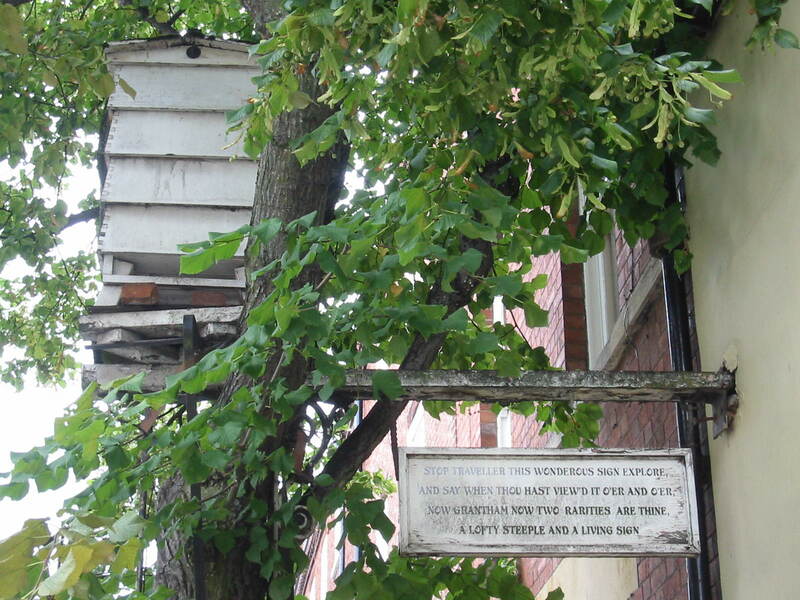 Placed on a raised platform surrounded by Shawcross’s drawings the work commands respect, bringing its own inspirational gravitas to Parasol. 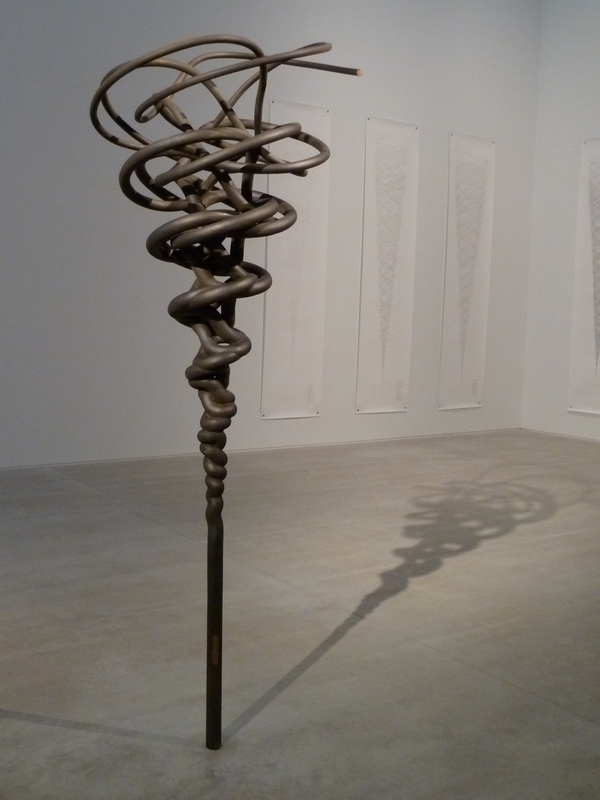 Conrad Shawcross, Harmonic Manifold 1 (5:4), 2011. Own photograph. The exhibition is a well-thought out idea, nothing radical, nothing subversive. My fellow gallery-goer thought it had crossed the line and was dull. I thought the strength of the disparate works kept it interesting. The main problem is that line can be so manipulated that, in fact, the theme of the exhibition is everything, as everything uses line. Outside at Parasol. Own photograph. Parasol will always have the advantage that their stunning gallery space shows off works to their best no matter what they are. It was a warm evening and people were milling outside by the pond, sipping champagne under Yamada’s SAD light and returning to the exhibition with smiles on their faces. 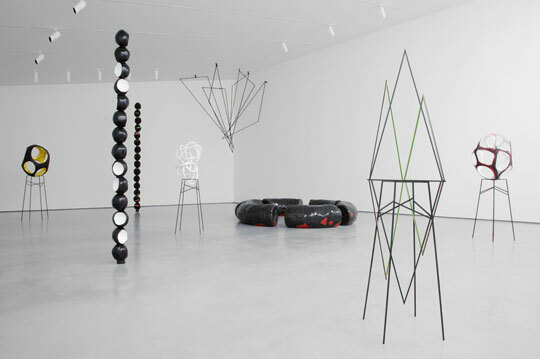 Lines of Thought is at Parasol unit until 13th May 2012, www.parasol-unit.org. My favourite exhibitions really left their mark, those I can still immediately recall that still delight me. I’ve chosen the shows that weren’t just aesthetically pleasing but were also well-curated and academically interesting. These are the ones that tick all the boxes. Towering at Tate – The Gerhard Richter exhibition that is still on show at Tate Modern is breath-taking, looking at Richter’s diverse oeuvre as an unbroken panorama. At Tate Britain, Vorticists win the prize – charting a short-lived movement, Tate aimed to place Vorticism in an international context, studying the impact of World War I on these artists. 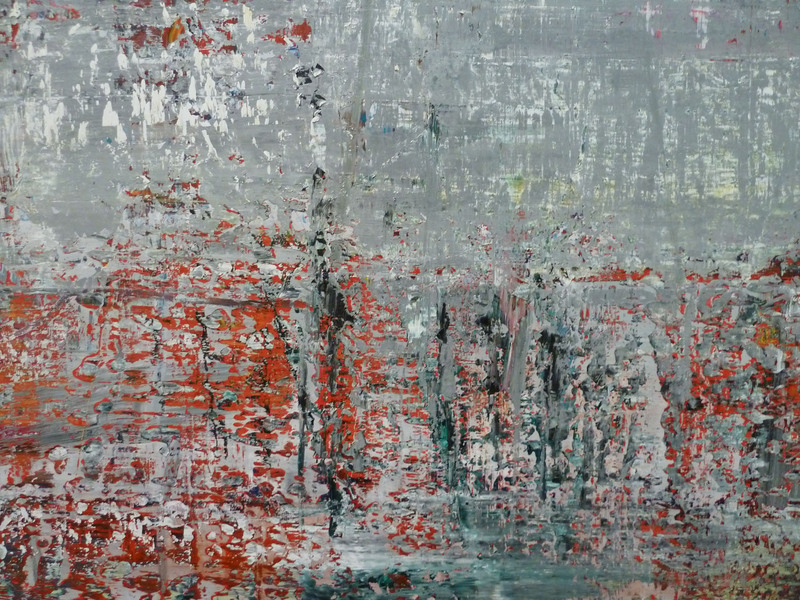 Detail of one of Gerhard Richter’s Cage Paintings, 2006. Own photograph. Rocking at the Royal Academy – The Royal Academy’s upstairs gallery has to have one of the strongest exhibition programmes in London. It’s a tie for the best show there this year between the recent Soviet Art and Architecture and Eyewitness: Hungarian Photography. 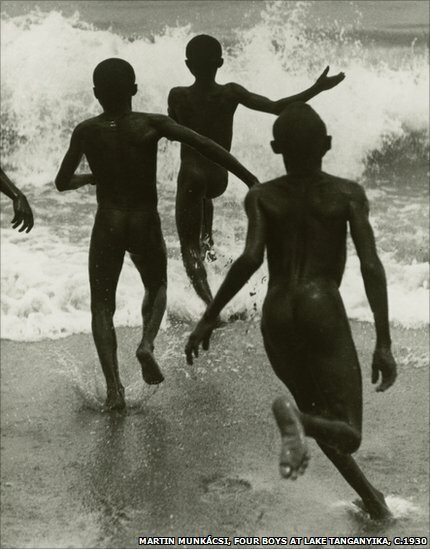 Martin Munkácsi, Four Boys at Lake Tanganyika, c. 1930. Image via www.bbc.co.uk. Knockout at the National Gallery – For me, Drenched in Devotion stole the show this year. 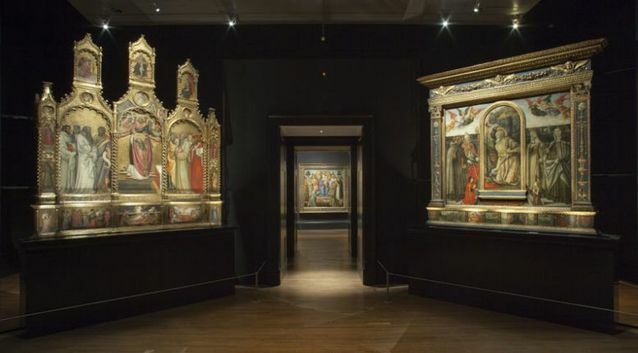 Looking at altarpieces in their context, the NG examined their structure and relationship to the surrounding architecture, following the formal, stylistic and typological developments across the period of focus. 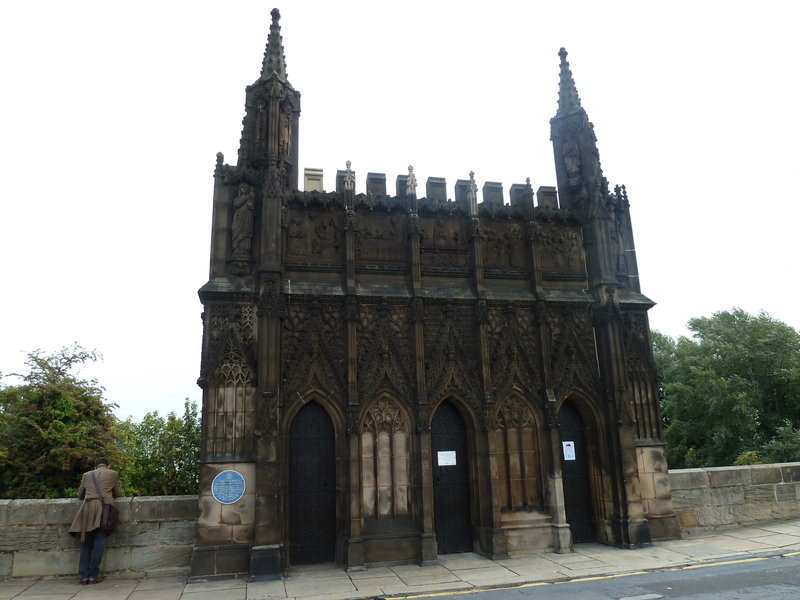 One room was even turned into a chapel. Room two in Devotion by Design. Image via www.independent.co.uk. Leaving London – Revealed: Turner Contemporary Opens was an extremely strong exhibition to launch another new public art gallery designed, of course, by David Chipperfield. Highlights were from Daniel Buren and Conrad Shawcross. Daniel Buren, Borrowing and Multiplying the Landscape, 2011. Own photograph. Striking Silver – The Cult of Beauty at the V&A looked at art, from 1860-1900, created purely for its own sake to provide pleasure and beauty. 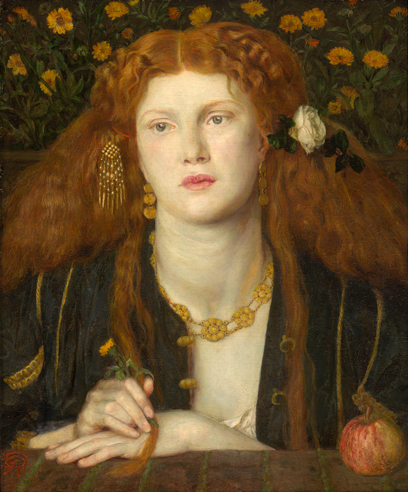 Dante Gabriel Rossetti, Bocca Baciata, 1859. Image via www.vam.ac.uk. Bright Bronze – Future Tense’s Spectra I focused on colour – a simple concept but one that was wonderfully addressed with some of the best lighting I’ve seen this year. 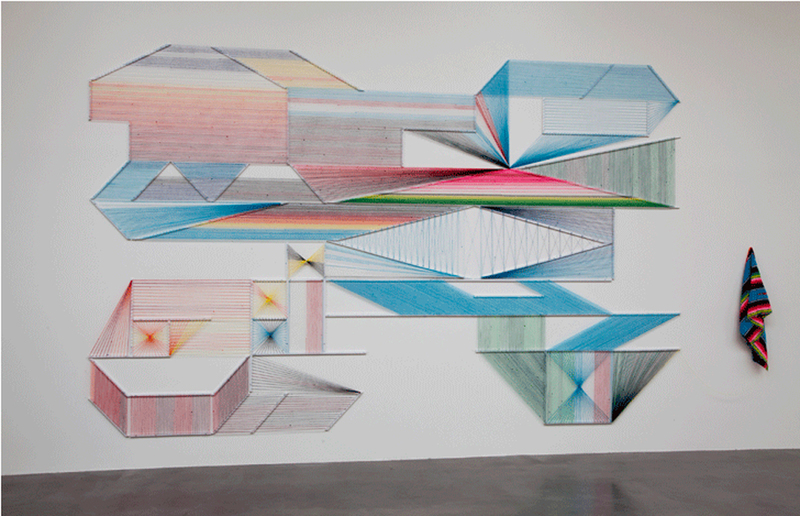 Lee Baker, Refractive Monolith, 2011. Own photograph. and last but by no means least – Runner Up – the brilliant Anthony McCall taking over Ambika P3 with his entrancing light works that combined cinema, drawing and sculpture. 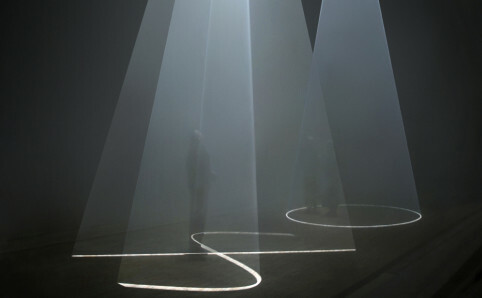 Anthony McCall, Vertical Works, 2011. Image via http://www.dontpaniconline.com. Aaah… but there was also the shoes exhibition, Rembrandt and Bacon at Ordovas, Nicola Hicks and Mona Kuhn at Flowers, the many brilliant shows at Josh Lilley and the poignant timing of Lisson’s Ai Weiwei show. What a year! To look back at these exhibitions, use the categories or tags on the right hand side of the screen to make scrolling that bit easier. Let’s hope that 2012 can move on from the success of these shows and be bigger, better and braver than ever before. I’ll be there, in my stilettos, doing the rounds. In the meantime, thank you for reading Artista. A Merry Christmas and a Happy Shoe Year to you all. I have lived in London all my life and although I’ve used the Edgware Road tube stations on many occasions they will always remain a mystery. Try as I may, I never seem to come out of the right one. Thank heavens for google maps – which decided to work for this visit. After a quick reorientation, I set off for Bell Street. Daniel Buren at Lisson Gallery with 7 Lines of Electric Light: white & orange, 2011, seen through the window. Own photograph. The last Daniel Buren piece I saw was at Turner Contemporary earlier this year and I was eager to see his new work at the Lisson Gallery. Buren is known for creating, often large-scale, site-specific works that play on architectural, spatial and social elements and this is exactly what he has done here. Walking into A Perimeter for a Room, situated in the main gallery space, is like walking into another world. 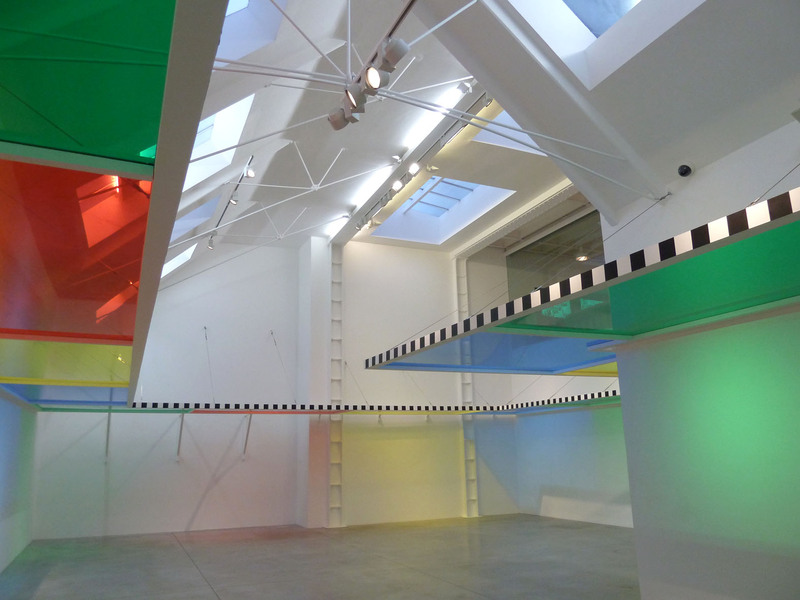 Daniel Buren, A Perimeter for a Room, 2011. Own photograph. Horizontal Plexiglas panels, coloured with self-adhesive vinyl, are used to alter our perception of space by creating an internal division, introducing a new height within the room. The walls are washed with coloured shadows, warming the visitor with this glowing light. The work is designed to change our outlook and heighten our sensitivity as our vision is altered by a new, dynamic colour palette. 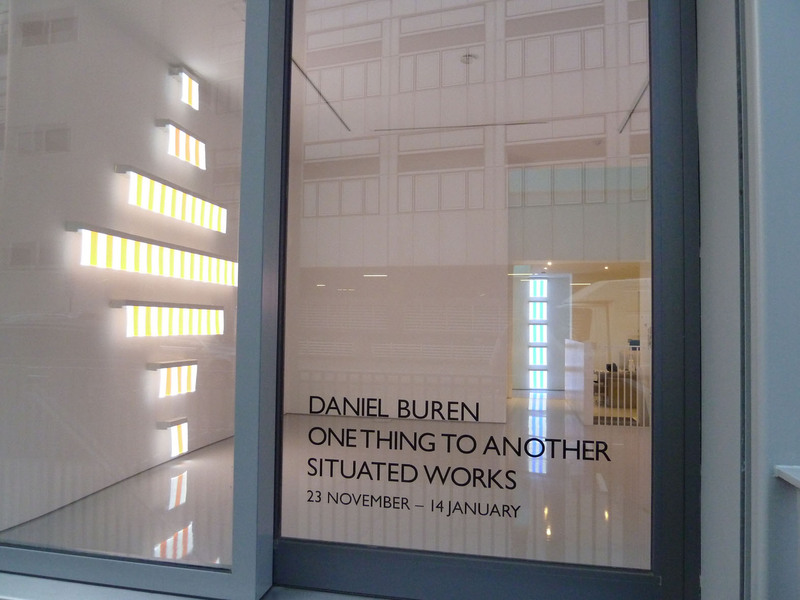 The front of the gallery shows Buren experimenting with a new material made of woven fibre optic. The pieces have a powerful visual effect, illuminating their surroundings while the strong geometric patterns relate to the architectural structure of the room and, of course, Buren’s stripes form the basis of the works. Buren is constantly re-asserting himself and pushing the boundaries of his well-established visual language. His works no longer surprise but they do delight and ‘if it ain’t broke, don’t fix it’ – his formula succeeds. 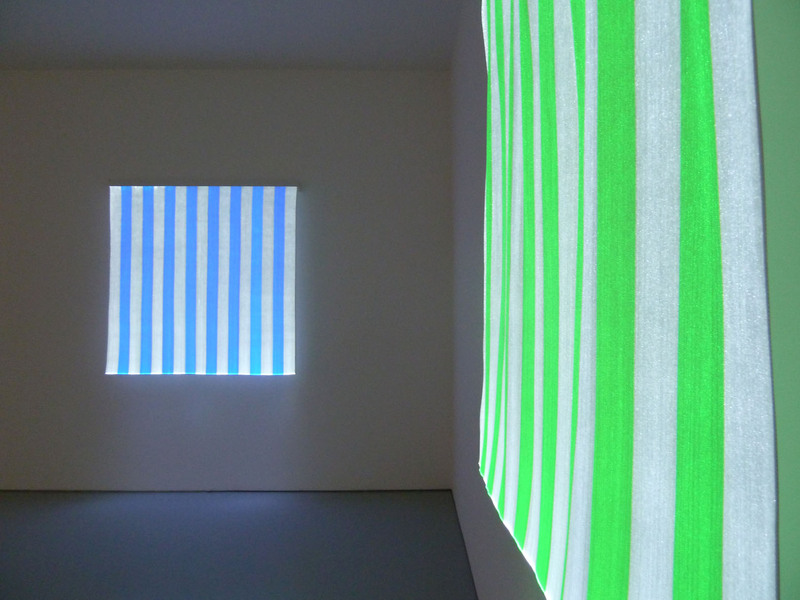 Daniel Buren, detail of A Square of Electric Light # 2, 2011 and detail of A Square of Electric Light # 1, 2011. Own photograph. Finally, there is a piece outside, a variation on a pergola designed to play with outdoor light and the movement of the sun. 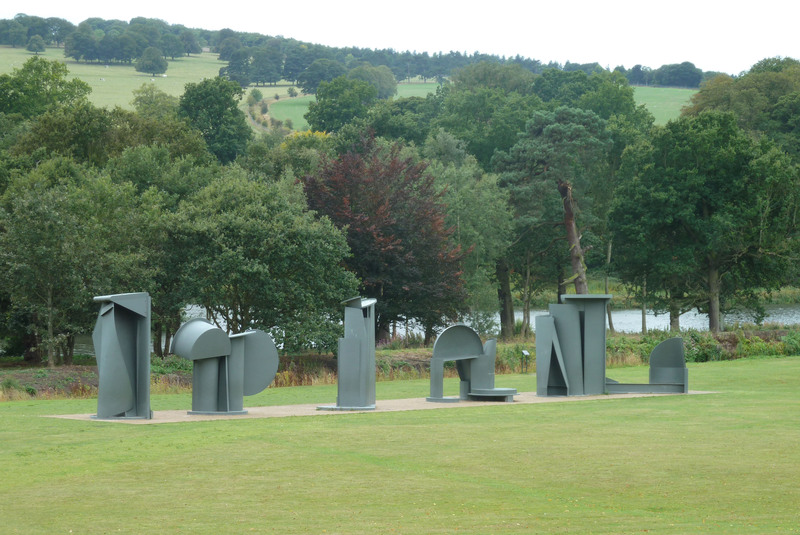 I loved the exhibition so I have no doubt that this work is equally mesmerising when seen in the right weather conditions but, it was rather grey and gloomy so the impact was lost. 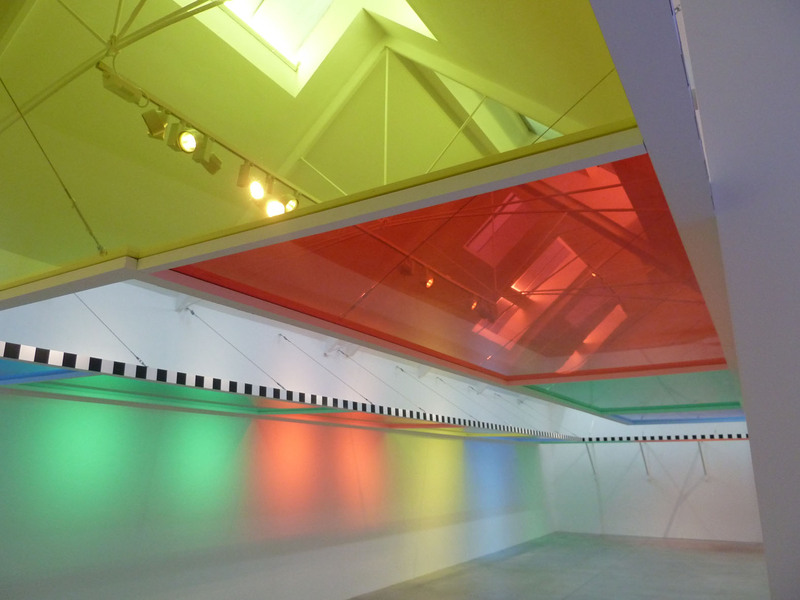 Daniel Buren, 4 colours at 3 metres high, 2011. Own photograph. Buren’s visual vocabulary is simple but beautiful – his experimentation with light and colour is hypnotic, transforming the visitor’s vision. Across the road are three video pieces by Allora & Calzadilla that each studies the complicated history of Vieques, an island of Puerto Rico, that was used by the US Navy as a bomb-testing range from 1941 to 2003. All of these works present issues about Vieques’ state of flux – a place caught between disaster and progress, oblivion and memory, grief and hope. I found myself drawn to one work in particular – Half Mast\Full Mast focuses on the unfinished political, economic and ecological reconstruction of the island and stands apart from the other videos with its slower, more meditative approach. Split into two sections, it consists of landscape views of various sites in Vieques. The horizontal divide is broken (or crossed) by two poles, aligned to form one object, that evoke an unofficial flagpole. Various young males hoist themselves up the pole, using their amazing strength to go from a standing position to horizontal. They must have been doing their core work in yoga! Their bodies momentarily form an unofficial flag – sometimes at half-mast, as if in mourning, and sometimes, jubilantly, at full-mast. Although the work presents an overall feeling of calm, the unpredictable appearance of the ‘flag’ both celebrates a place while conjuring up a sense of discontent. Allora & Calzadilla, Half Mast\Full Mast, 2010. Own photograph. 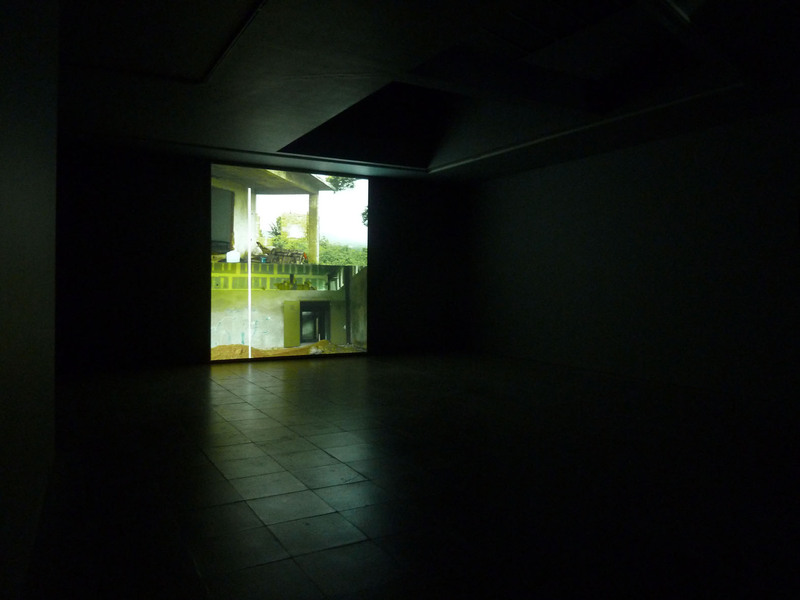 Allora & Calzadilla successfully discuss weighty issues with a light-hearted, sometimes absurd overtone. Both exhibitions work very well in parallel – although visually there can be no comparison; they both tackle their subject in a simple but beautiful and thought-provoking way. 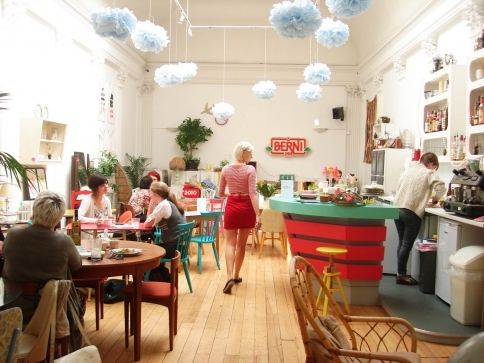 Next it was time for tea at Drink, Shop & Do – a haven in Kings Cross, nestled in an old Victorian bathhouse and the perfect place for tea, cake and cocktails. Drink, Shop & Do. Image via www.alicebytemperley.com. Daniel Buren: One Thing To Another, Situated Works and Allora & Calzadilla: Vieques Videos, 2003-2011 are both at the Lisson Gallery until 14th January 2011, www.lissongallery.com. 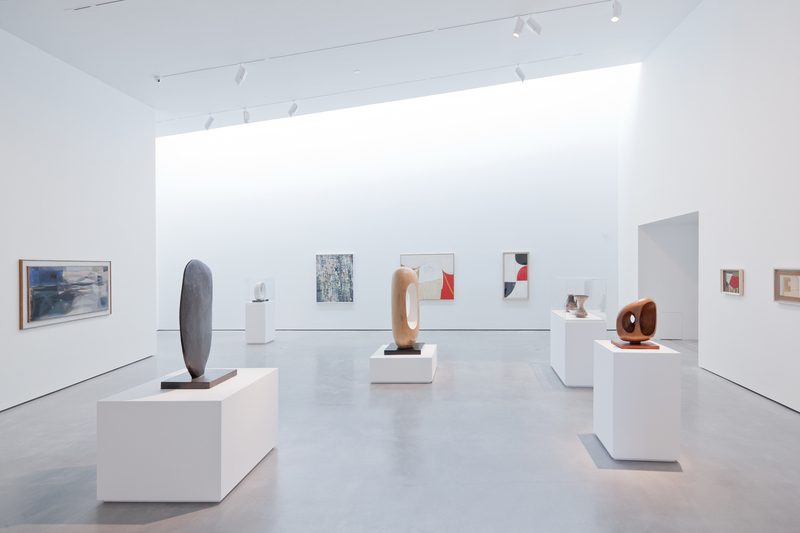 Never being one to do things by halves, when I decided to drive my Mini to Turner Contemporary, I took the opportunity to cram a jam-packed schedule into two days and explore Kent. My time in Canterbury started with a scrummy picnic lunch punting on the Stour. I’m a Cathedral addict and Canterbury has long been one of my favourites in England. If you haven’t been, shame on you. With wide-ranging, mostly French, influences, the building presents a harmonious and inspiring interior. Buildings of the Gothic era, particularly Cathedrals, were ornamented appropriately to the function they served. Such ideas of decorum ensured that a Saint’s shrine and its surrounds required the most lavish design and sculptural decoration and reflected the valid aesthetic ideas of the period. The Archbishop of Canterbury, Thomas Becket became a ‘medieval celebrity’ after his brutal murder in the Cathedral on 29th December 1170 and he is buried in a majestically designed chapel, approached by increasing architectural richness on the climatic processional pilgrimage routes. The monks of Canterbury regarded him as a second Christ. Like Christ, he returned on Palm Sunday, presided over his ‘last supper’, was struck down by enemies of the state and had five wounds inflicted on him. Poetic hagiography is incorporated into the Trinity Chapel where red and white stone symbolise Becket’s blood and brain; the red also depicts Becket as a martyr and the white shows his inner martyrdom. This analogy has strong Christological references as blood and water spilled from Christ’s side wound. This trip included many favourites for me: cathedrals, ruins, the seaside and the work of Antony Gormley. Nowadays, his sculptures are ubiquitous in cathedrals and one is suspended in the crypt. Made of recycled iron nails from the repaired roof, Transport hangs above the site of Becket’s first tomb. The 6ft floating man reminds us that we are temporary inhabitants of our bodies; they house our souls and are the instruments through which we are able to communicate our emotions. 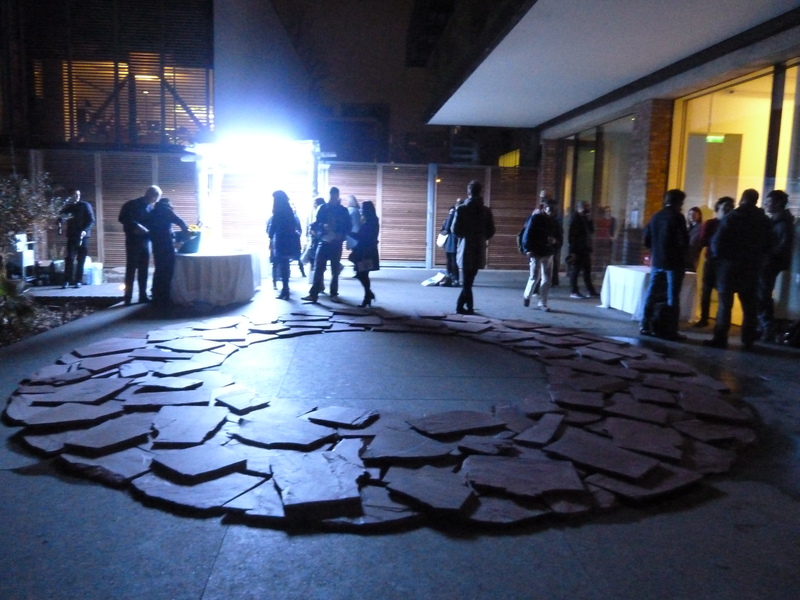 The piece expresses transience and reflects the way in which sacred spaces communicate a sense of time and eternity. After popping into St Augustine’s Abbey (founded in AD 567 by St Augustine during his mission to convert the pagan Anglo-Saxons to Christianity), I headed to Richborough Roman Fort and Amphitheatre. Although Richborough is now over two miles from the sea, it was once a bustling port that saw the first Roman landing – hard to believe now when looking at the surrounding countryside. After struggling with English Heritage’s poor signage, I finally found St Augustine’s Cross – a 19th century cross of Saxon design marking what is thought to have been the site of St Augustine’s landing on the shores of England in AD 567. After a wonderful day, I arrived at a gorgeous B&B in Broadstairs before heading off to a wonderful dinner in Ramsgate. The coastal villages seem to be stuck in a time warp – old chippies, amusement arcades and enormous beaches – with shabby, run down seafronts. That’s not to say that they aren’t charming in parts as Kent really is a beautiful county but some of these places feel like they have been left behind. Early the next day, I drove along the pretty but somewhat dilapidated coast to Margate. Margate must have been wonderful in its heyday but is now very sad, mostly boarded up and shut down. 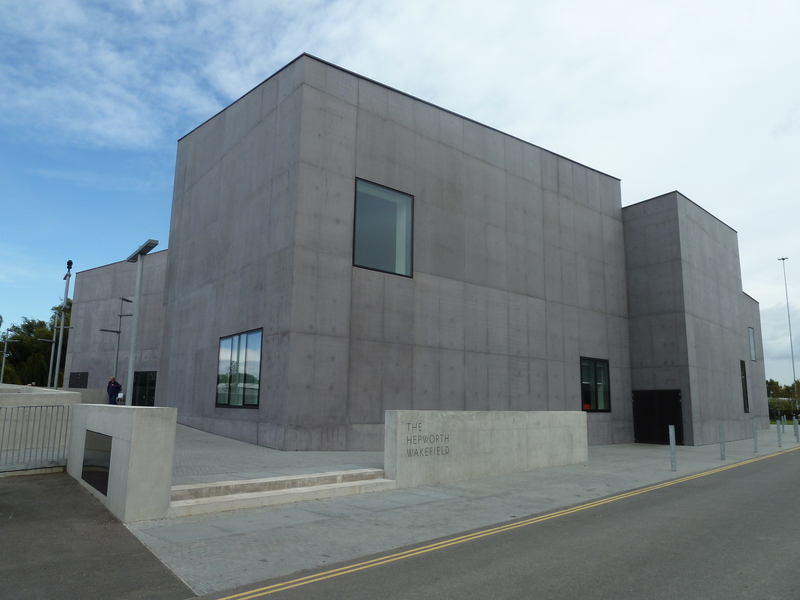 Turner Contemporary, the brand new public art gallery, is an imposing landmark and rises from the site of the lodging house where Turner stayed in Margate. The view outside probably hasn’t changed much since his visits. Sitting on the seafront, the building needed to be tough and robust. After the initial shock factor of the arresting structure, designed by David Chipperfield architects, its charm becomes apparent. Formed of six interlocking rectangular blocks, the two-storey building can evoke boat sheds or connecting artists’ studios. Flooded with natural light, the interior consists mostly of polished concrete and glass – a simple and clean design that is both austere and beautiful. Chipperfield wanted art to be experienced rather than viewed and has made the open spaces like studios. He succeeds, at the same time creating an intimacy conducive to wonderful exhibitions. It is a triumph, perfectly in tune with its purpose and location. Turner spent time in Margate throughout his life and many of his works feature the Kentish coast. 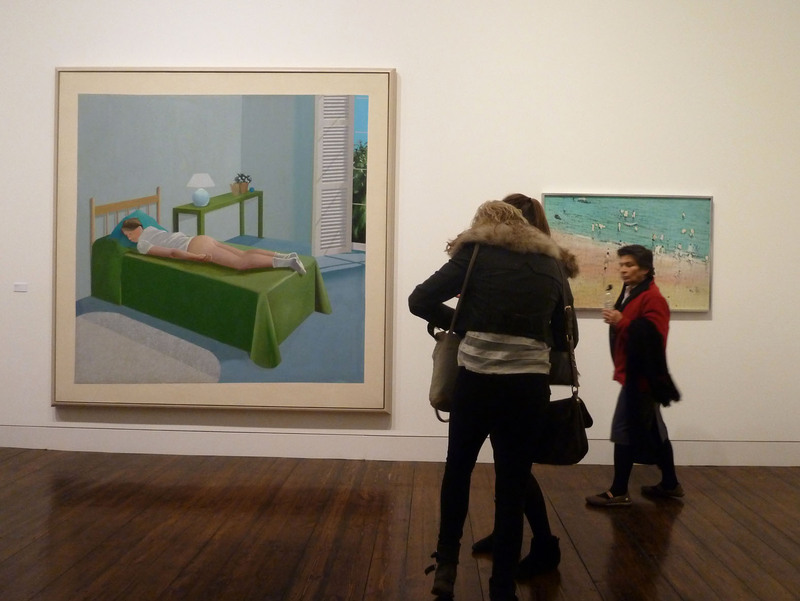 Turner Contemporary celebrates his connection with Margate and one or more of his paintings will always be on display in the gallery. The current exhibition Revealed: Turner Contemporary Opens takes inspiration from Turner’s 1815 painting of a volcanic eruption on the island of St Vincent. Turner was fascinated by the power of nature and this painting captures the drama. His works give the viewer sensory experiences transcending their surroundings to become part of the scene. The only permanent work, Michael Craig-Martin’s neon Turning Pages invites you to begin your metaphorical journey around the galleries. I don’t have a bad word to say about the current exhibition. 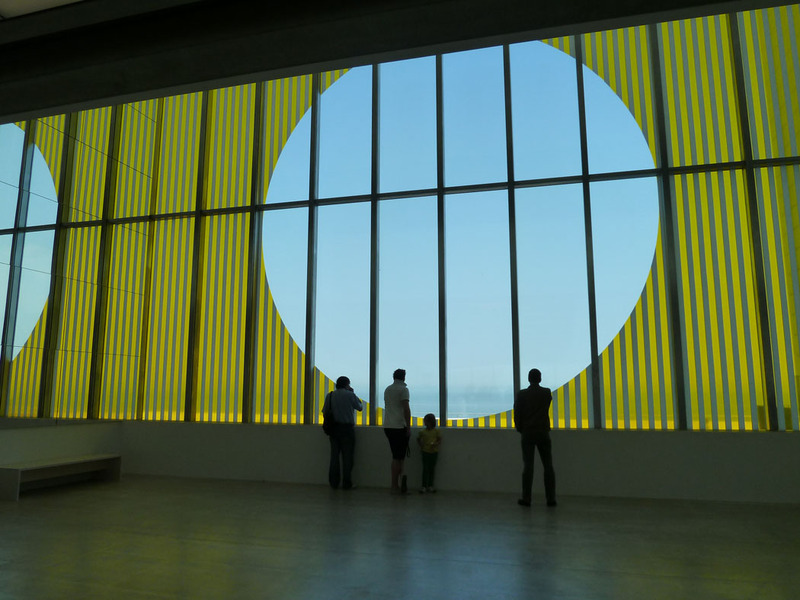 Daniel Buren makes use of the large window and walls. His work frames the outside panorama, using mirrors to reflect and amplify the glorious coastal scene and a vivid yellow to further lighten and brighten the galleries. Douglas Gordon’s text work Afterturner, on the treads of the staircase, plays with Turner’s supposed last words. Though the stairs have generated criticism for being tucked away and simple, I had no trouble finding them and felt a grander structure would have been out of place and detract from the large open plan resonance. Ellen Harvey’s newly-commissioned Arcadia is a scale reconstruction of the gallery Turner built to house his work, filled with engraved lightboxes with views of present-day Margate. 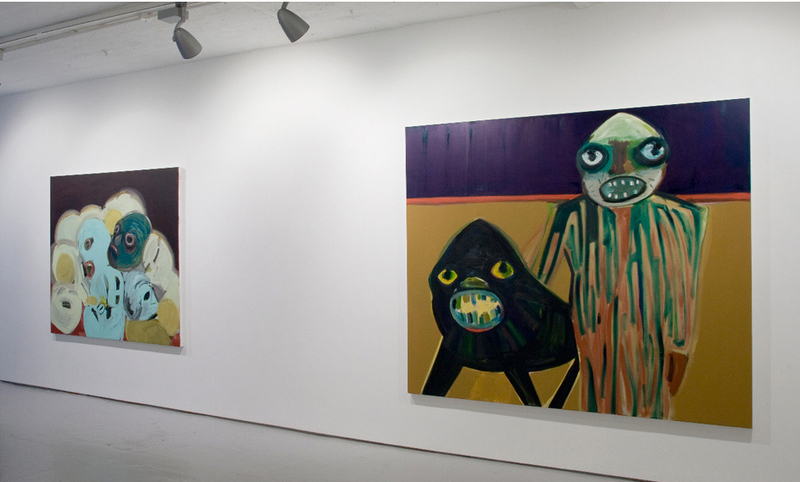 There are also great works by Teresita Fernández and Russell Crotty. For me the star of the show was Conrad Shawcross; his ingenious installations Projections of a Perfect Third seek to understand the musical chord. Shawcross is fascinated by science and philosophy and this dramatic installation brings together different threads from his practice. His mysterious, enigmatic structures leave you in awe, staring at the near-sublime rotating form that hangs above you, whirring in perpetual motion no matter what. Shawcross’s machines are designed with no specific working purpose, suggesting a quest for a perfect ideal. They are intricate manifestations of his thoughts and ideas showing the skill of his craftsmanship through beautiful, mesmerising forms. The giant rotating wings (like helicopter blades or windscreen wipers) captivate viewers, leaving them standing engaged but lost. Strangely, Emin, Margate’s most famous daughter, is not included in the exhibition but her pink neon sign, I never stopped loving you, is installed above the door of the nearby tourist information centre and harbour master’s office. The work is almost invisible in daylight and I had to ask someone to point it out. Unfortunately (or perhaps fortunately) I wasn’t in Margate at night to see if the work is more effective, dramatically illuminated on the front but, when the sun is shining, it is lost to the surrounding architecture and Emin’s thoughts remain unheard. Due to the amount of walking, this was a flip-flops only trip but, in my hurry to get down to the beach to take photographs looking up at Turner Contemporary, I didn’t spot a large slimy patch of seaweed and managed to launch myself down the lifeboat ramp. Splat! Ouch! That’ll teach me not to wear flat shoes! Once a popular seaside resort (the famous Dreamland is expected to re-open in 2013), Margate is now rather run-down. The perfect weather when I visited only served to highlight the town’s shabbiness. Turner Contemporary is meant to be a catalyst for regeneration but, as much as I adored it, I’m not sure that this alone is enough. The effect Turner Contemporary will have on the town and whether it will initiate the long-awaited Margate renaissance remains to be seen. The locals have already embraced it, nicknaming it ‘The Turner’, but will it trigger the much-needed regeneration and prompt change? On the way home, I stopped at Reculver where the 12th century towers of a ruined church stand defiant among the ruins of a fort and monastery. Finally, oysters and a wander in Whitstable before returning to London. And all in less than 2 days. Of course, if you aren’t feeling quite that intrepid, the train will get you to Margate in only a couple of hours and you too can spend the day at the seaside. All photographs are my own. 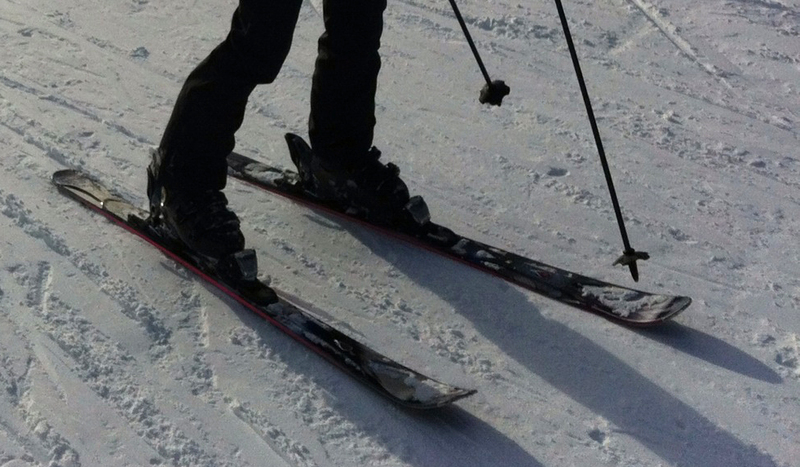 More can be seen at: http://www.facebook.com/media/set/fbx/?set=a.187173014662889.42704.121039074609617.